Dr Rajan Sharma qualified from Guy’s Dental Hospital in London in 2001. Working in both access centres and hospitals, he developed his surgical skills. Locally he has worked at The Royal Berkshire and Wexham Park hospitals. His surgical flair led him to undertake a year course in 2007 in Dental Implants studying at The Tatum Institute in Birmingham and further courses in the USA and Europe. He has also trained postgraduate dentists in implant dentistry. His gentle nature and extensive experience in oral surgery has proved very successful with his patients and postgraduates. 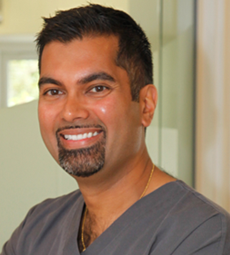 As part of Evergreen’s commitment to advancing developments in dentistry, Dr Sharma is currently using PRGF (Plasma Rich in Growth Factors), a cutting edge treatment to stimulate and accelerate the processes of tissue healing and regeneration after surgery (bti-biotechnogyinstitute.com/gb/patients). His constant thirst for education has led him to provide excellence in dentistry using cutting edge equipment. In order to compliment his implant and cosmetic dental work, Dr Sharma has trained over the years to provide facial rejuvenation treatments to many of his patients. Please click here for more information. Dr Sharma’s extensive skills and experience in this field have led him to become a clinical instructor for the internationally renowned Dr BK Training Institute for facial aesthetic treatments. Again as part of the Evergreen experience, he uses modern equipment to deliver various types of facial treatments with minimum discomfort. Dr Sharma studied at the Pankey Institute for Advanced Dental Education in Key Biscayne, Florida (www.pankey.org). This has enabled him to undertake more complex cases and provide more comprehensive treatment to his patients. He has continued to develop his skills by attending a number of international symposiums. By using all of his extensive training that he has gained and with the modern equipment, Dr Sharma always aims to provide high quality dentistry for each patient. His gentle nature means that patients are always treated as individuals. Dr Sharma prides himself in being a very caring and professional dentist who is keen to help his patients achieve their goals. Rajan and the team at Evergreen are excellent and I would have no hesitation in recommending them for dental treatment, particularly for dental implant work.